Notre Dame's star linebackerManti Te'o faces a problem bigger than any running back he's had to bring down. As the elaborate hoax about his dead "girlfriend" unravels, many questions remain to be answered, chief among them whether he was complicit in promoting the dramatic story of his girlfriend's death from leukemia. Te'o may soon be forced to tackle those questions himself. "A lot of people are very suspicious when Te'o says he had no idea and he was just a sucker in this," Deadspin writer Timothy Burke said on "Good Morning America" today. "Why would somebody go to such great lengths to hoax him like that?" Click here for 'Catfish' stars' advice on online dating. Burke's Deadspin story broke the scandal, forcing Te'o and Notre Dame to admit the girlfriend, Lennay Kekua, never existed. 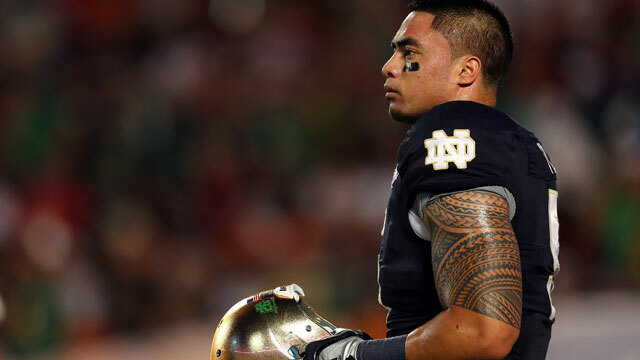 Notre Dame claims that Te'o is the victim of a "cruel hoax." "[Notre Dame is] sticking to his story and they're going to, I think, fight and make every sort of attempt they can to prove he had no idea this was going on and that he was the unfortunate victim of a year-long prank," Burke said. "I think that there are some questions about when he became aware of it, simply because Notre Dame and Te'o's statement have indicated that he found out about it in late December, but he chose not to correct or identify when he was asked before the BCS Championship game about his girlfriend," he said. The championship game was played on Jan. 7. Burke said he is particularly eager for answers about the story Te'o told of meeting his girlfriend in 2009 and his father Brian Te'o's statements about how the purported girlfriend used to visit Manti in Hawaii. What is clear is that Te'o tweeted Kekua twice after she was reported to have died on Sept. 11 or 12, 2012. On Sept. 12, the day after his grandmother's death, Te'o tweeted to his purportedly deceased girlfriend, "You will always be with me wherever I go! Tell dad, BJ, papa Ima, papa Santiago, and grandma that I said hello! I love you! #574L." Nearly two months later, on Nov. 6, he tweeted her again saying, "I miss you!" Those tweets may be an indication of his sincerity or, to skeptics, elaborately planted fake evidence of his heartbreak. One of Te'o's teammates who asked not to be identified told ABC News that the news of the hoax has been "just crazy" and that he believes that Te'o was a victim of the hoax. When asked what the team has been saying, he said, "I can't talk. Team rules." The teammate said that Te'o did have a local girlfriend since last summer, but declined to elaborate. Other students have expressed similar support for their star linebacker. "We were all really shocked for sure and definitely almost heartbroken that something this crazy and just this terrible could happen to someone that we all look up to," student Rachel Seral said. She said that students "stand behind him 100 percent." "I do believe him," student Francesca Simon said. "Of course there are some suspicious parts of the story, but it's hard to believe that someone could do something so cruel. And I hope that he's telling the truth and wouldn't let people that have faith in him down." Students said they hoped the situation would "blow over" soon so that Te'o could move on with his career. The university's athletic director Jack Swarbrick said at a Wednesday night news conference that the school was not speaking for Te'o. "At the end of the day, this is Manti's story to tell and we believe he should have the right to tell it, which he is going to do," Swarbrick said. Swarbrick said that Te'o and his family came to the university last month with concerns that Te'o had been the victim of a hoax. "The university immediately initiated an investigation to assist Manti and his family in discovering the motive for and nature of this hoax," he said. "While the proper authorities will continue to investigate this troubling matter, this appears to be, at a minimum, a sad and very cruel deception to entertain its perpetrators." The school's investigators monitored online chatter by the alleged perpetrators, Swarbrick said, adding that he was shocked by the "casual cruelty" it revealed. "They enjoyed the joke," Swarbrick said, comparing the ruse to the popular film "Catfish," in which filmmakers revealed a person at the other end of an online relationship was not who she said she was. "While we still don't know all of the dimensions of this ... there are certain things that I feel confident we do know," Swarbrick said. "The first is that this was a very elaborate, very sophisticated hoax, perpetrated for reasons we don't understand." Click here for more scandalous public confessions. Swarbrick also said that he believed Te'o's representatives were planning to disclose the truth next week until Wednesday's story broke. Te'o, who led the Fighting Irish to the BCS championship game this year and finished second for the Heisman Trophy, has only issued a written statement so far. "This is incredibly embarrassing to talk about, but over an extended period of time, I developed an emotional relationship with a woman I met online," Te'o said in the statement. "We maintained what I thought to be an authentic relationship by communicating frequently online and on the phone, and I grew to care deeply about her." Te'o said during the this year's football season that Kekua died of leukemia in September on the same day Te'o's grandmother died, triggering an outpouring of support for Te'o at Notre Dame and in the media. At the time of her supposed death, Te'o said he had spoken with Kekua on the phone and text message until her death, "While my grandma passed away and you take, you know, the love of my life [Kekua]. The last thing she said to me was, 'I love you,'" Te'o said. Deadspin reported that the image attached to Kekua's social media profiles, through which the pair interacted, was of another woman who has said she did not even know Te'o or know that her picture was being used. The website reported that it traced the profiles to a California man who is an acquaintance of Te'o and of the woman whose photo was said to be stolen. Te'o is currently preparing for the NFL draft, according to his statement. +Will Notre Dame Use Painkiller In Championship Game Tonight?